Groves (2002) provisionally listed two subspecies of Grévy's Zebra. However, Groves and Bell (2004) concluded that the species is indeed monotypic. Reviewed by Churcher (1993). Grévy's Zebra is confined to the Horn of Africa, specifically Ethiopia and Kenya. They may persist in southern Sudan. Grévy's have undergone one of the most substantial reductions of range of any African mammal. Historically, they ranged east of the Rift Valley in Kenya to western Somalia, and in northern Ethiopia from the Alledeghi Plain through the Awash Valley, the Ogaden, and north-east of Lake Turkana in Ethiopia to north of Mt. Kenya and south-east down the Tana River in Kenya (Bauer et al. 1994). Currently, Grévy's Zebra have a discontinuous range, and are found from the eastern side of the Rift Valley in Kenya to the Tana River. There is a small, isolated population in the Alledeghi Plains north-east of Awash N.P. in Ethiopia. From Lake Ch'ew Bahir in southern Ethiopia, the population extends to just north of Mt. Kenya although a few animals are found further south- east along the Tana River. A small introduced population survives in and around Tsavo East N.P. in Kenya. They are considered to be extirpated from Somalia (where the last confirmed sightings date to 1973) and from Djibouti; there are no confirmed records that the species ever occurred in Eritrea (Yalden et al. 1986; Bauer et al. 1994). Sightings from southern Sudan require verification (Williams 2002, in press). Yalden et al. (1996) recorded them to 1,600m in Ethiopia. Current estimates put the total population of Grévy's Zebra remaining in the wild in Kenya and Ethiopia at approximately 1,966 to 2,447 (B. Lowe pers. comm. 2008; F. Kebede pers. comm. 2008). From 1988 to 2007, the global population of Grévy's Zebra declined approximately 55%. The worse case scenario is a decline from 1980 to 2007 of 68%. The number of mature individuals is approximately 750, and the largest subpopulation is approximately 255 mature individuals. In Kenya, the Grévy's Zebra population declined from an estimated 4,276 in 1988 (KREMU 1989) to 2435-2707 in 2000 (Nelson and Williams 2003) to 1567-1976 in 2004 (B. Low pers.com) to an estimated population size of 1468-2135 in 2006 (B. Low pers. comm. 2007). In 2007, the population estimate of 1838-2319 indicates that either more individuals were being accurately observed or that the population is stabilizing and increasing (Mwasi and Mwangi 2007). The trend from 1988 to 2006 (18 years) is a decline of 50 to 66%. The data for 2007 indicates a potential increase in the population in Kenya. In Ethiopia, Grévy's Zebra declined from an estimated 1,900 in 1980 to 577 in 1995 (Rowen and Ginsberg 1992; F. Kebede pers. comm. 2007), to 106 in 2003 (Williams et al. 2003). In 2006, the population in Ethiopia was estimated to be 128 (F. Kebede pers. comm. 2007). The trend from 1980 to 2003 (23 years) is a decline of roughly 94%. The data for 2006 indicates a potential increase in the population in Ethiopia. The density and area of occupancy of Grévy's Zebras fluctuates seasonally as animals move in their search for resources. During the dry season, when they are dependent on permanent water, animals tend to be more concentrated. However, given that they can move up to 35 km from water even during the dry season, their densities are never high. They are most abundant and most easily observed in the southern portion of their range in southern Samburu and the Laikipia Plateau. 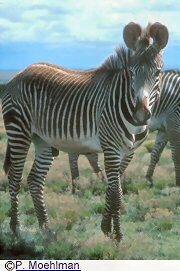 Grévy's Zebras live in arid and semi-arid grass/shrubland where there is permanent water (Klingel 1974; Rubenstein 1986; Rowen and Ginsberg 1992; Williams 2002, in press). They are predominantly grazers, although browse can comprise up to 30% of their diet during times of drought or in those areas which have been highly transformed through overgrazing. Breeding males defend resource territories (water and food being the key resources) of 2-12 km2; the home range size of non-territorial individuals is up to 10,000 km2. They are extremely mobile and individuals have been recorded to move distances of greater than 80km, with movements determined by the availability of resources; lactating females, for example, can only tolerate one or two days away from water (Klingel 1974; Rubenstein 1986; Rowen and Ginsberg 1992; Williams 2002, in press). The major threats to Grévy's Zebra include: reduction of available water sources; habitat degradation and loss due to overgrazing; competition for resources; hunting; and disease (Rowen and Ginsberg 1992; Williams 2002, in press). In Kenya, hunting for skins in the late 1970s may have contributed to the observed decline, although recent data suggest that the continuing decline in this country is attributable to low recruitment due to low juvenile survival. This is a result of competition for resources - both food and access to water - with pastoral people and domestic livestock (Williams 1998). However, a low level of hunting of Grévy's Zebra for food and, in some areas, medicinal uses continues (Williams 2002, in press). Furthermore, the water supply in critical perennial rivers has declined, most notably in the Ewaso Ng'iro River where over-abstraction of water for irrigation schemes has reduced dry season river flow by 90% over the past three decades (Williams 2002, in press). In Ethiopia, killing of Grévy's Zebra is the primary cause of the decline (F. Kebede pers. comm. 2007). Recently, Muoria et al. (in press) recorded an autbreak of anthrax in the Wamba area of southern Samburu, Kenya, during which more than 50 animals succumbed to the disease. Listed on CITES Appendix I. Grévy's Zebra are legally protected in Ethiopia, although official protection has been limited. Community-based conservation has been more effective. In Kenya, they have been protected by a hunting ban since 1977. While under the Wildlife Conservation and Management Act No 376 of 1976 (Part II of the First Schedule), Grévy's Zebra was listed as a 'Game Animal' (Williams 2002); they are currently being uplisted to a legally 'Protected Animal' in Kenya. At present, protected areas form less than 0.5% of the range of Grévy's Zebra. In Ethiopia, the protected areas are nominal (Alledeghi Wildlife Reserve, Yabello Sanctuary, Borana Controlled Hunting Area and Chalbi Sanctuary). In Kenya, the Buffalo Springs, Samburu, Shaba N.R. complex and the private and community land wildlife conservancies in Isiolo, Samburu and the Laikipia Plateau provide a core and crucial protection of Kenya's southern population of Grévy's Zebra (Williams 2002). On the Laikipia Plateau, protection and reduced competition with domestic livestock, have seen Grévy's Zebra numbers increasing since they first expanded into this area in the early 1970s (Williams 2002, in press). Kenya has recently taken steps to develop a national conservation strategy for Grévy's Zebras. Ethiopia has held two workshops on the status and conservation of the Grévy's Zebra. 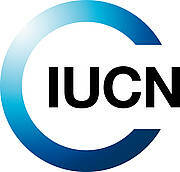 Research and community-based conservation is on-going in the three known population areas. Williams (2002) highlights several other conservation actions focused on wild populations, involving: 1. Protection of water supplies; 2. Management of protected areas; 3. Community conservation; and 4. Monitoring of numbers in the wild. Listed as Endangered as Grévy's Zebra is estimated to have declined by more than 50% over the past 18 years based on direct observation and potential/actual levels of exploitation. In addition, the current total population is estimated at 750 mature individuals, with the largest subpopulation estimated at 255 mature individuals. Name(s) of the Assessor(s): Moehlman, P.D., Rubenstein, D.I. and Kebede, F.
Evaluator(s): Low, B. and Flander, M.
Bauer, I. E., McMorrow, J. and Yalden, D.W., 1994, The Historic Ranges of Three Equid Species in North-East Africa: A Quantitative Comparison of Environmental Tolerances. Journal of Biogeography 21: 169-182. Churcher, C. S., 1993, Equus grevyi, Mammalian Species, 1-9. Dirschl,H.J. and Wetmore, S.P., 1978, Grévy's zebra abundance and distribution in Kenya, 1977. Aerial Survey Technical Report Series No. 4, KREMU. Nairobi. Klingel, H., 1974, Social Organization and behaviour of the Grévy's zebra, Z. fur Tierpsychologie36, 36-70, , KREMU, 1989, Livestock and Wildlife Data Summary 1987-1988. Department of Remore Sensing and Resource surveys, Kenya. Data Summary No.1. Muoria, P.K., Muruthi, P., Kariuki, W.K., Hassan, B.A., Mijele, D. & Oguge, N.O., in press, Anthrax outbreak among Grévy's zebra (Equus grevyi) in Samburu, Kenya., African Journal of Ecology. Mwasi, S. and Mwangi, E., 2007, Proceedings of the National Grévy's Zebra Conservation Strategy Workshop 11-14 April 2007. KWS Training Institute, Naivasha, Kenya.